Simon and I met at University 10 years ago, and Simon proposed in New York on my surprise 30th birthday trip! We got married a year and a day later. We chose an autumn wedding as we both feel it is a beautiful time of year, and we hadn’t necessarily had our hearts set on a summer wedding as many people do. May as well start with Dale! We knew of Dale through a photographer friend of ours. We had met with a few photographers, but when we spoke to Dale we knew immediately that we would get on, which friends had told us is so important when choosing a photographer. He was fantastic, and really made us feel at ease. We could really enjoy the day without worrying that he was taking pictures of us, and it felt really natural. He and Gabi were great and captured some wonderful moments, we couldn’t be happier with the photos we have to remember our day. We had an engagement shoot with Dale in London a few months before the wedding, so we could meet in person and practice ‘being in front of the camera’, so it felt much more natural on the day. Simon is Northern Irish and my family live in Berkshire, so we originally looked around both areas for venues. We absolutely fell in love with Wasing Park, Aldermaston, which my mum had mentioned to us as a potential venue. Everything about it was what we had pictured for our wedding day – a country venue with a long drive through rolling fields, which is absolutely stunning on a sunny day (with the odd pheasant running around! ), and actually still very beautiful in the rain! St Nicholas Church Wasing is a simple but beautiful church and exactly what we wanted when we came to say our vows. It has a lovely congregation and we been warmly welcomed back for Sunday services since our wedding day! We had a lovely organist who played some beautiful music for us, and as my brother is a fantastic guitarist we asked him to play for us during the signing of the register which again made it really personal for us. We used the converted outbuildings for the rest of our day – Castle Barn is a big converted brick and wooden barn where we held our wedding breakfast and evening reception, and the Garden Room is where we had afternoon reception and canapes. The beauty of this venue and the buildings is that it is a blank canvas – we felt we could really make it our own and put our own stamp on our wedding day. The staff at Wasing Park are fantastic, we couldn’t have asked for a better team and we had complete trust in our events coordinator for the day, which really took the pressure off us knowing that she was in control of everything. 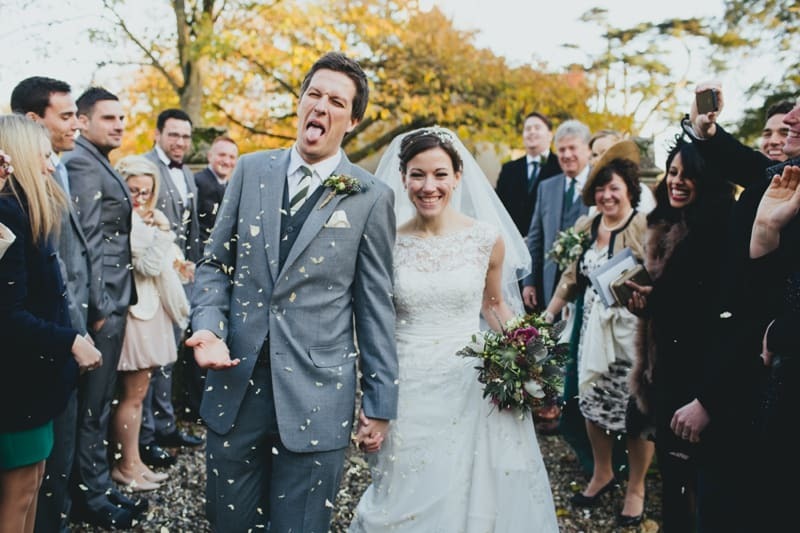 As we were a late November wedding, we were very aware that it would be chilly! We wanted to give the place a really warm feel, with lots of soft lights and candles, so that when our guests walked into the barn they would feel instantly cosy. We hired a fairy light canopy (Oakwood Events) to give the high ceilings some warmth, which worked really well. We had lots of tealights in the arrow slits around the whole of the barn, which added to the ambience. Our table centres were also designed around candles and light, so there was a lot of soft flickering candlelight and warmth which is exactly what we had hoped for! Just before the wedding breakfast, we had a sparkler line with our guests lined up either side for us to walk into the Castle Barn, which was great fun! The table centre names were based on our local watering holes, for which Simon went out and took pictures of the pub signs which I framed in various mis-match frames. For favours, I made dark chocolate and pistachio fridge brownies. I had bought muslin from the local fabric store and cut it into squares, tying the brownies into little parcels with twine, attaching each guests name – these also served as place names so saving a job! The place names themselves I stamped (stamps from paperchase) onto brown luggage tags, in keeping with the simple country feel of the day. I made a few handmade signs, and my mum’s neighbour is wonderfully creative so made our table plan and some signage to place around the venue on the day. All these little things made it a little more personal, and it was satisfying to know we had put our on unique stamp on our day. Our florist (White Horse Flower Company) was absolutely amazing in creating our vision for the Castle Barn. She was completely open to our ideas from the beginning, which was great. Whilst we knew we wanted lots of lights, when it came to the types and colours of flowers we were a bit stumped! But Lindsey spent ages with us going over options, and we decided on a autumnal-type feel to the bouquets and buttonholes, with lots of autumn colours, textures and some guinea fowl feathers. My bouquet was stunning and exactly how I had imagined it, and she even came on the day with a selection of ties to go round the stems to make sure I was 100% happy. Everybody has since commented on how beautiful and unique the centrepieces and bouquets were, and we couldn’t have been more thrilled with them. My dress was ivory lace and chiffon, a design by Sincerity. It was actually the very first dress I tried on – I tried many different designs and styles, but I kept coming back to this one. I decided on a veil and headpiece to match the lace of the dress, with lace shoes . I loved how chiffon was so much lighter than some of the heavier silks and satins, and as I don’t normally wear dresses I felt so much more comfortable. The dressmaker even commented on how it was unusual to have lace and chiffon together in one design, and loved the combination. I’d always wanted green for the bridesmaids dresses, and went with a forest green as it went well with an autumn wedding. All I asked of them was that they choose a chiffon style, otherwise I left it up to them to choose which design they wanted! We matched the dresses with a simple ivory pashmina to keep them warm in the church! Simon had his suit made by a tailor, and decided on a grey mohair with waistcoat. He matched it with brown shoes and belt, and a dark green and ivory tie to keep with the green theme. The groomsmen had matching checked 3-piece suits, which we bought for them from Next, matched with a dark green tie and pocket square which we also bought. The boys appreciated this, as they have since been able to use the suits and waistcoats for casual use. We didn’t have to worry about the expense of a wedding car, as being on-site our ceremony and reception was well within walking distance of eachother! However, the one thing we thought we would miss from this element was even just a few minutes together before being whisked away for photos and doing the rounds talking to our guests. So we decided to use our MG (racing green! – to keep in with the green theme!) to go on a quick whizz down a few country lanes just to gather our thoughts and spend a few minutes just being together – we were lucky enough with the weather we could even have the hood down for added effect! Simon was primarily in charge of music, and we chose Funk City Band as they played our friend’s wedding and were fantastic. They really got the guests up on their feet, and were willing to play (or not!) anything we wanted. They made the evening reception really enjoyable and guests of all ages were dancing all night long – we didn’t want it to stop! The dance floor was never empty, and this is exactly what we wanted when we thought of our band. How cosy & warm did this wedding look? It was the perfect Autumnal day.